A little piece of my heart belongs to Abu Dhabi. I return time and again for so many reasons. Some are practical such as it is only 7 hours from London, guaranteed sunshine, low humidity, fabulous hotels, a stylish and top class destination, perfectly safe with lovely people. It is also very liberal towards Western tourists, you can comfortably walk around without any problem. The other reasons are more heartfelt, such as the magical desert, enchanting culture, the fascination of watching the country develop in such a positive and enlightened way, my love of the Arab horses, Camels, Falcons. There are so many exciting adventures to be had here, make sure you explore the country properly and don’t just sit in your fabulous hotel when you visit! 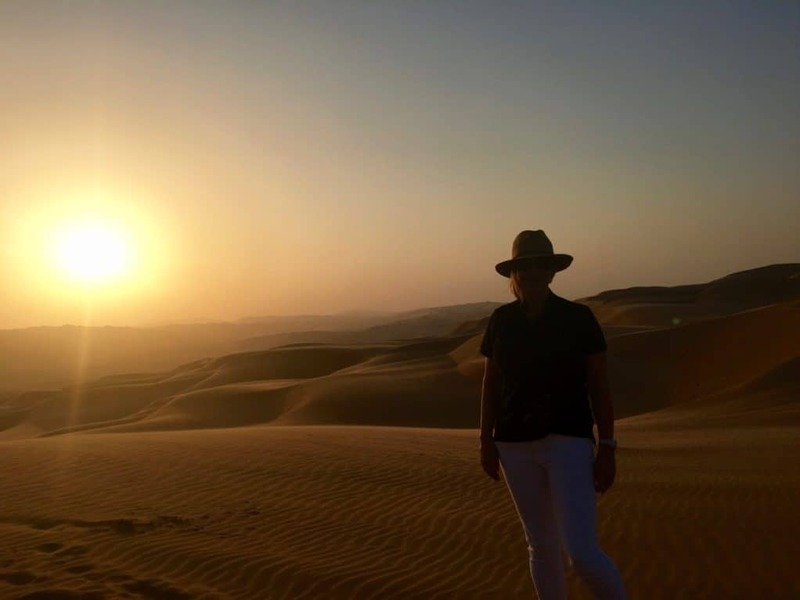 I would not visit Abu Dhabi without a trip into the empty quarter. Hire a car and driver or, like me hire a rental car and drive yourself around. Do not hesitate for a minute! Abu Dhabi drivers are the most polite in the entire world! There is no horn beeping or pushing and they drive in a very civilised way. 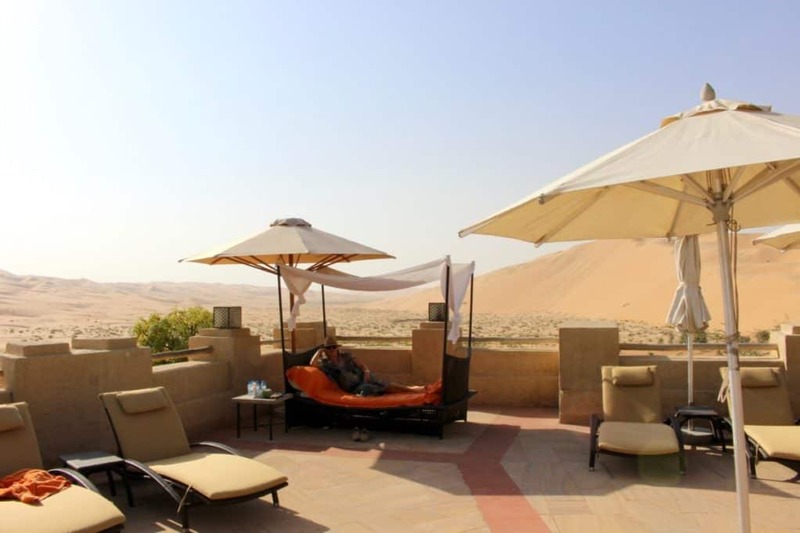 We stayed at Anantara Qasr Al Sarab Hotel which is approximately 2 hours drive from the city of Abu Dhabi. A really easy drive, with hardly another car on the road and quite an adventure out into the desert. Pass a few Camel farms on the way, so look out for Camels as you go! This is the only 5 star hotel in the area. 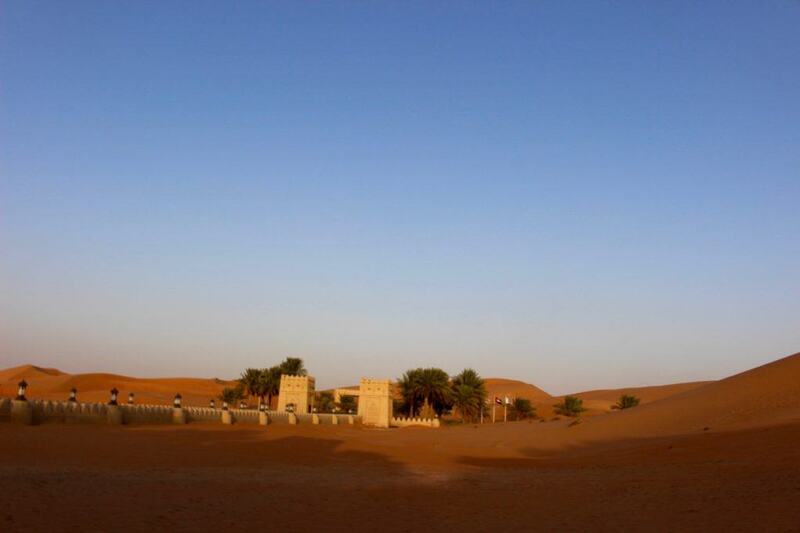 Villa Complex at Anantara Qasr Al Sarab. The hotel is well sign posted, you cannot miss it. Pass through the security check and drive for 11 km until you reach the hotel. The hotel driveway is extraordinary in the the most magical desert setting. Arrive and be whisked away by super efficient staff. Every Anantara hotel has impeccably efficient staff! The last time we stayed our room was in a super location on the left side of the main complex, number 400 plus. This time we were in 121 which was not so great. A lengthy walk away from everything and with far more rooms around, I did not like it nearly as much. I would definitely splurge on a villa! The first time we visited, a few years back the hotel was new and everything was immaculate. This time, I think it is ready for a room revamp because it is starting to look a little bit tired. My favourite thing about the room is the super comfy bed, gorgeous arabic styling and lovely relaxing terrace and private garden. The best bit is the bath! I have never seen such a magnificent bath. This is a joy after visiting so many new hotels this year that are just offering showers! The biggest round bath I have ever seen! Admittedly, I do travel with a lot of clothes but the lack of drawer space was a real problem. We lived out of a suitcase due to lack of anywhere to put things. As usual, way too few clothes hangers! Who loves a pool? We all do! This is a fabulous pool, spacious and with a separate children’s area. Great pool bar serving light lunches and so on around the pool. Pool with a fantastic view of the desert! If I was in charge at Anantara, I would build another quiet pool on the other side of the hotel for adults to chill out. 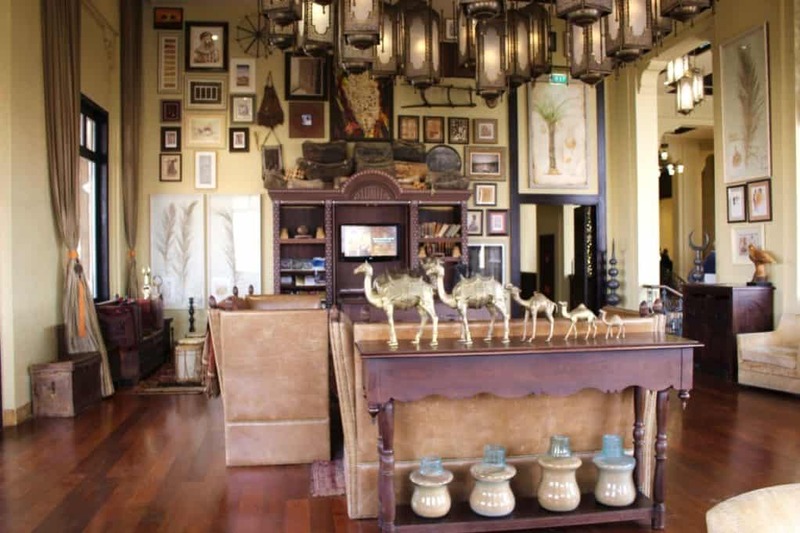 The main part of the hotel is exquisitely designed in an arabic style which is just enchanting. 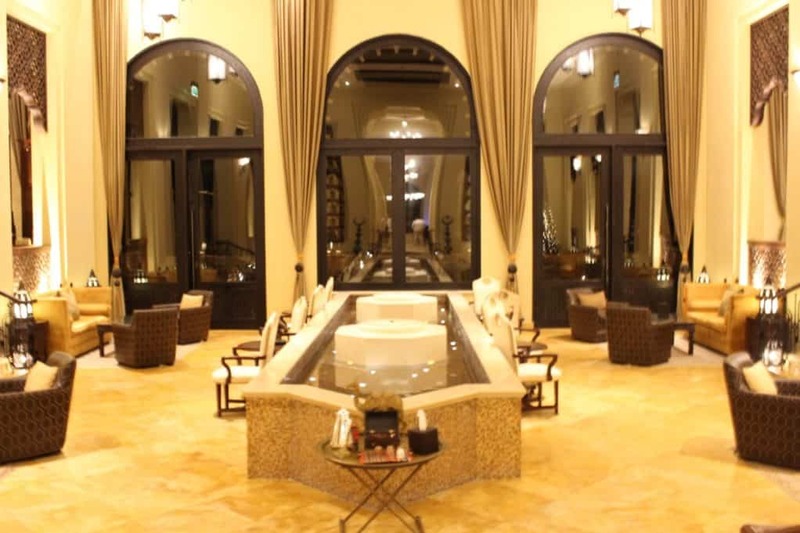 The reception is large spacious and welcoming leading onto a big lounge area. On the other side is a shop selling some interesting gifts and great Kaftans. 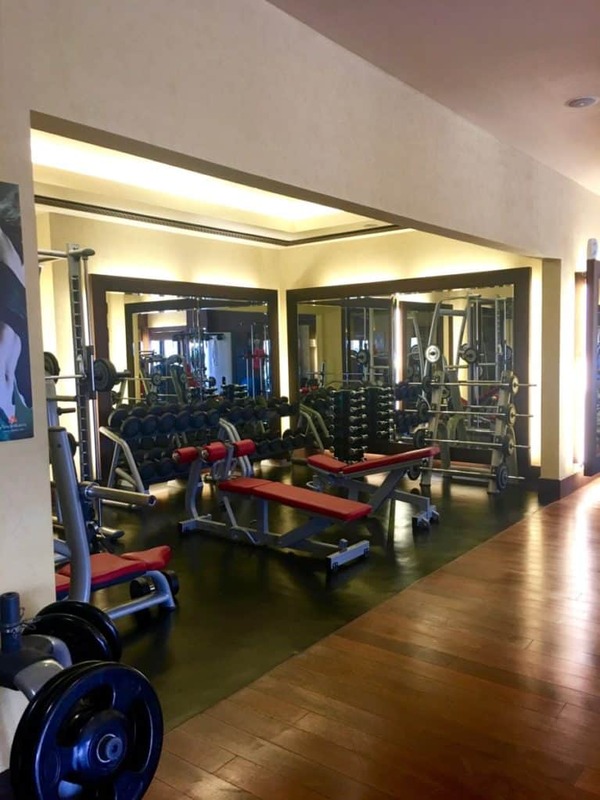 On the lower level is a fabulous gym and Spa. The food here is eye wateringly expensive! 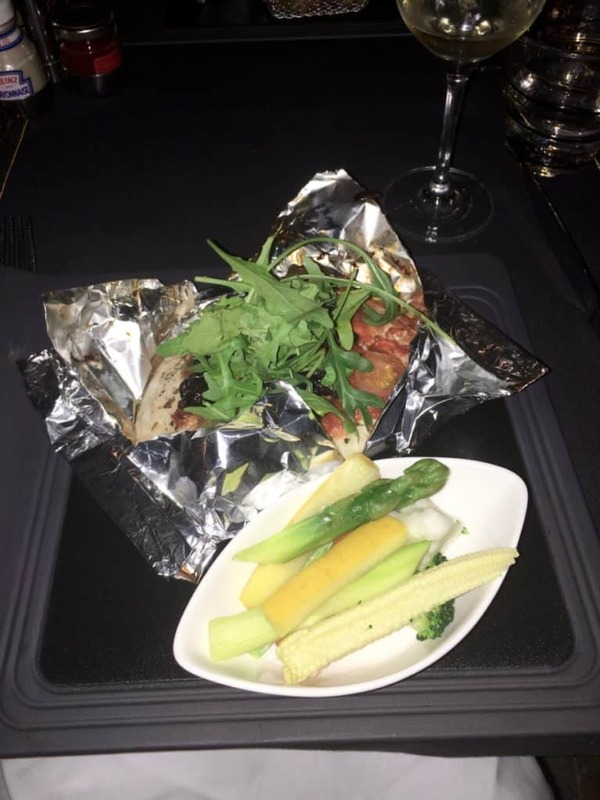 There is nowhere else to eat so my advice would be to take a meal package when you book. 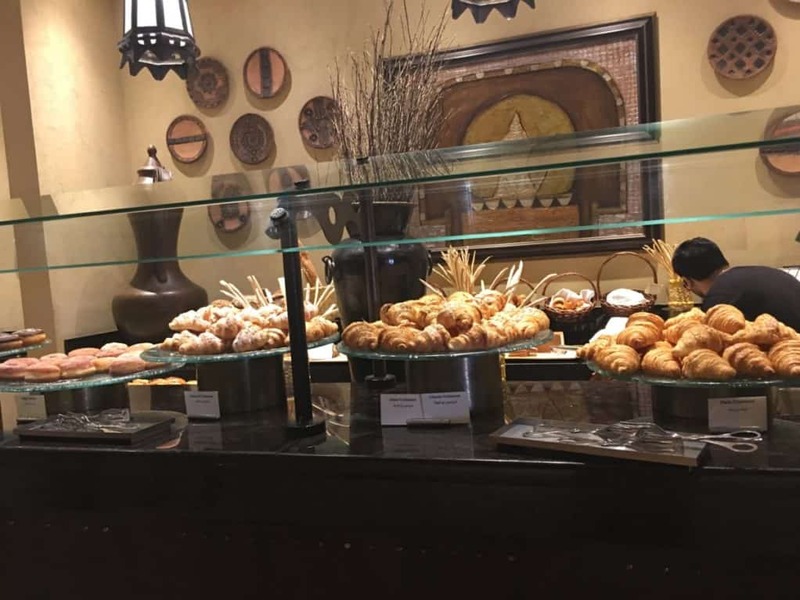 Buffet breakfast is served at the Al Waha restaurant. A huge buffet selection of everything you could possible want for breakfast! A good selection of different places to eat. 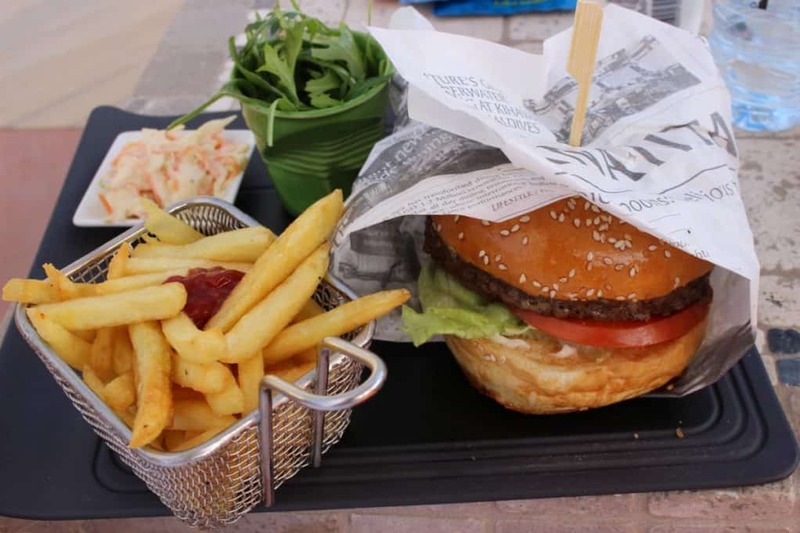 Situated near the pool and serves Local and Mediterranean dishes. 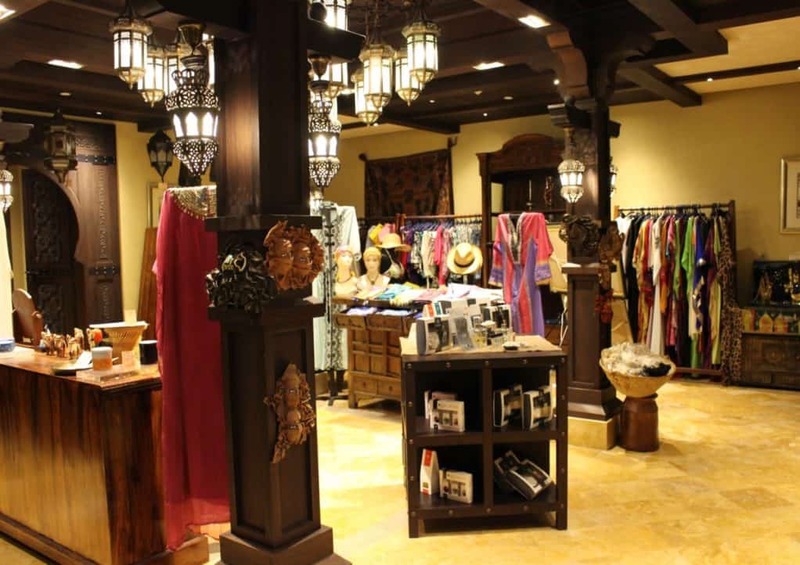 It also has a Shisha Lounge. The food was good, with an informal vibe. 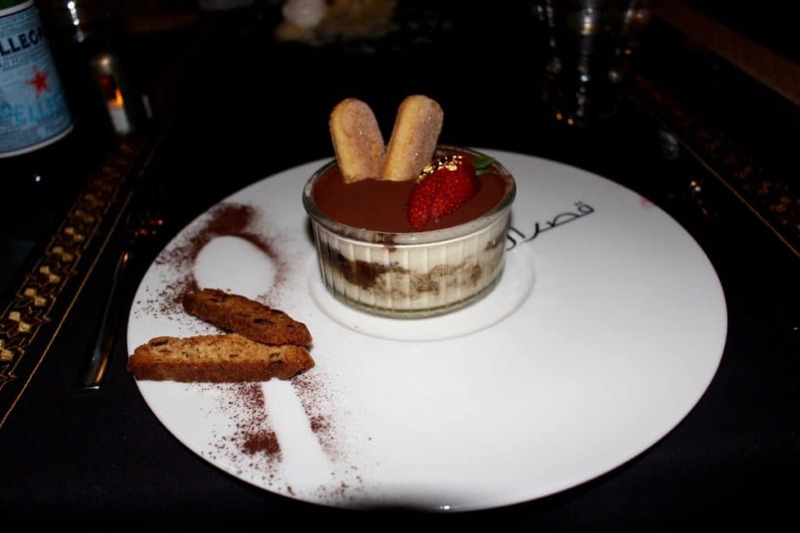 I enjoyed fish en Papillote and it was delicious, followed by Tiramisu, below. An upscale rooftop restaurant with an award winning wine list. Again the food was delicious. 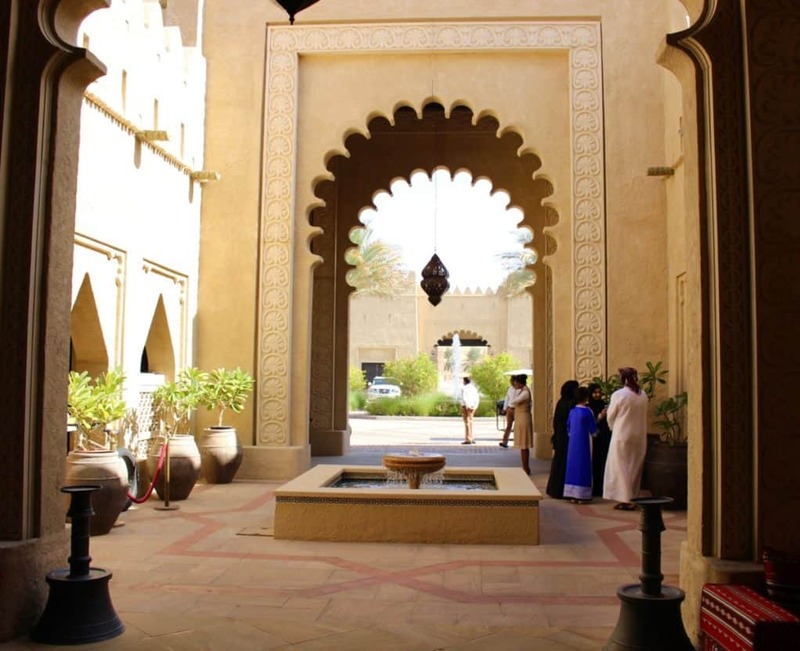 Other restaurants are Al Waha Restaurant which has a Middle Eastern and International cuisine buffet. 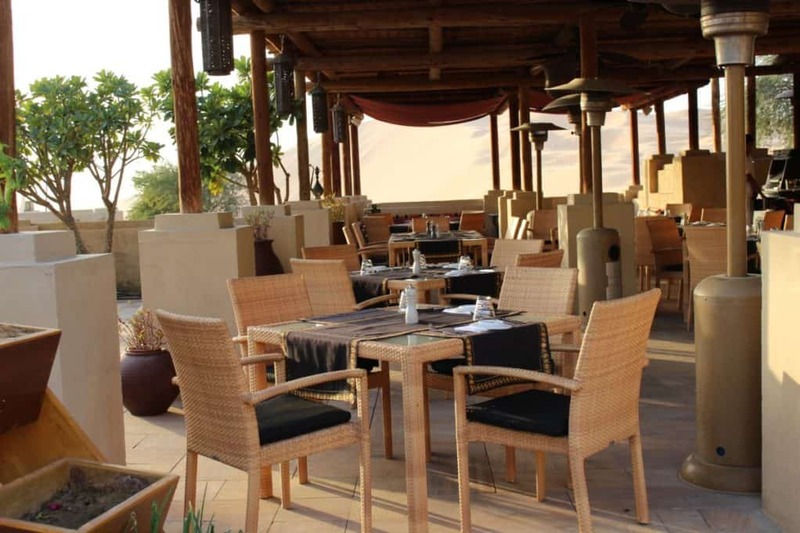 Also, Al Falaj, serving Middle Eastern food and barbecue in a wonderful tented area! 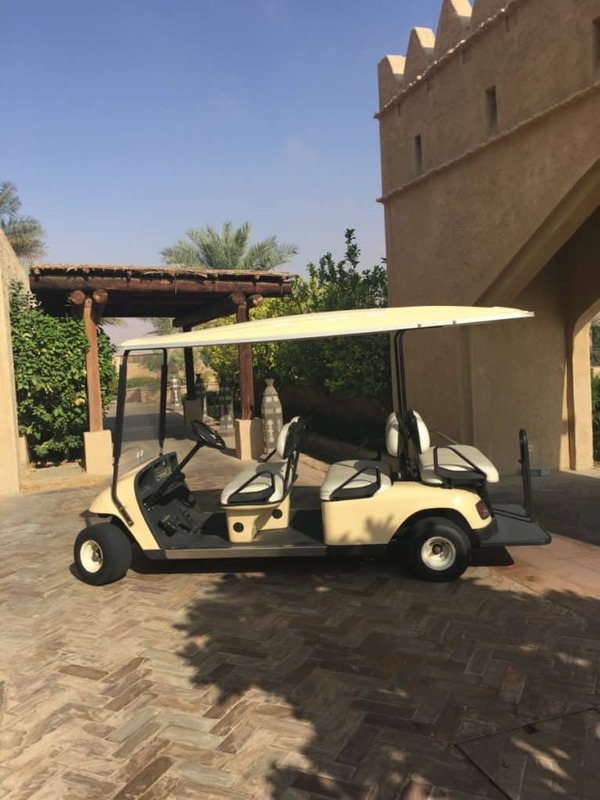 Apart from the beautiful desert location this is my favourite thing about Anantara Qasr Al Sarab. 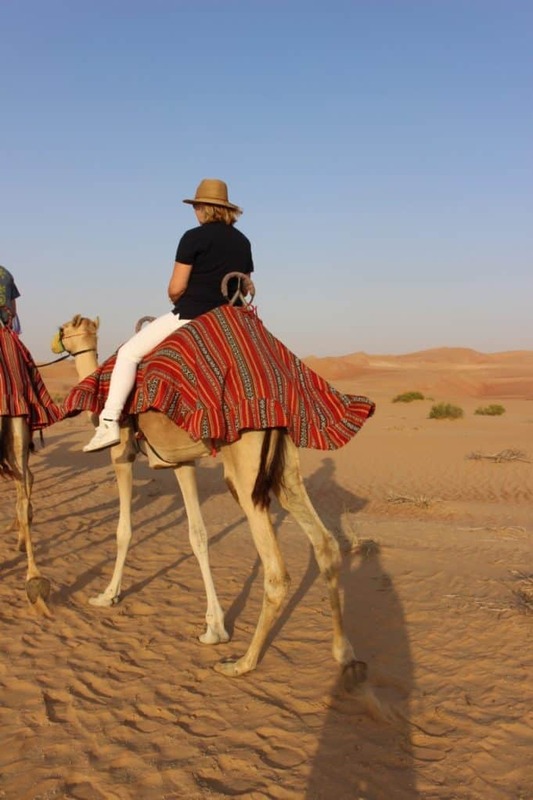 Especially the Camels and Camel riding, who an adventure! You can Camel Trek in the morning or evening. I chose the evening trek which lasts about 50 minutes with a very small group, which was perfect! There were 10 of us in total. A truly spectacular way to see the desert and this is followed by drinks watching the sunset. 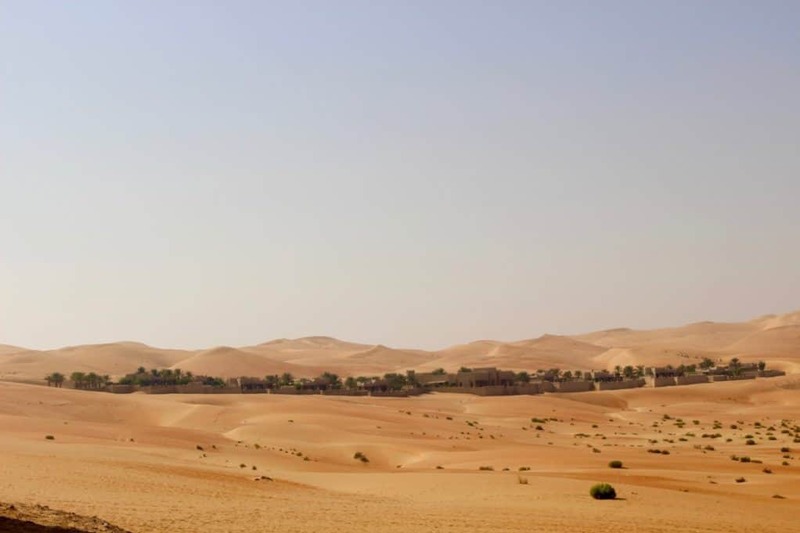 Trek in the desert, use the hotel fat tyre bikes, go dune bashing in 4 x 4 vehicles, see the Falcons, go riding on the Arab horses or explore on a Camel. You can see why people come back time and again! 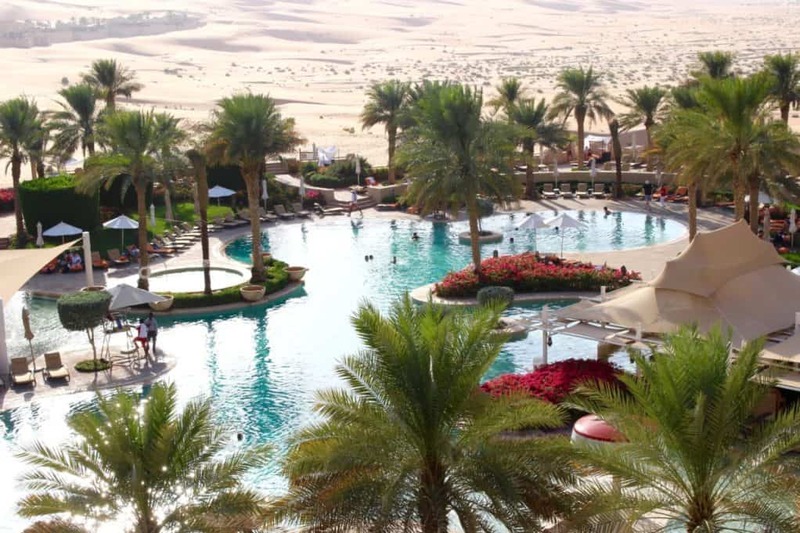 Go to Abu Dhabi in the winter when the weather is a perfect 27 degrees in December. The summers are very, very hot obviously!